In a previous post, I have introduced the Timer and Task components of Sencha framework. In this example more advanced, we will use the components timer/task of Sencha in order to show a progression bar in client side after the submitting of an business action to server. Each request sent by a client is identified by a requestID in order to get and display the progression’s state to the user. We will use the ConcurrentHashMap class in order to store the progression of each request sent by the client. ConcurrentHashMap class is a simple alternative for HashMap, and it offers a means of improving concurrency beyond that of normal HashMaps in order to eliminate the need for a synchronized blocks. 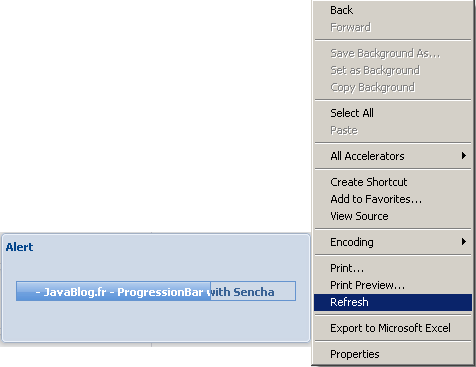 Here, it is the progression task updateWaitDialogProgressionTask which will be started by the timer. This task will call a method updateWaitDialogProgression sending the request to server in order to get the progression’ state of client request. On client side, the following method is the most important code. This method updateWaitDialogProgression is called by the progression task updateWaitDialogProgressionTask. It will send a request to server and decode the JSON response in order to update the progress bar with the current state on server side. At last, the following function is the callback method the above button to send a request for the “handleSaveBusiness” action to the server and start the timer on client side. On the server side, we will use the controllers based on Spring MVC. // Identifiy the request and is used to display the progression bar to the user. …so, if the user tries again to exit the current page, no message is displayed again. So, in this post, we have seen an example of implementation of Sencha components used for a progressbar. There are other application of Timers: Lock a business object on server from client side (via cyclic ajax request).